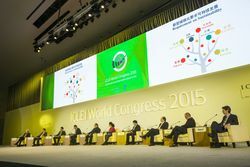 The four-day ICLEI World Congress 2015, which opened in Seoul, South Korea on 8 April, is the first in 20 years to take place in Asia following Saitama, Japan. On the second day of the congress, the first sub-plenary put its focus on China, the world’s largest economy and the home of the greatest number of cities. According to Tie Li, Director General of China Center for Urban Development (CCUD) the country has an urbanization growth rate of 1.3% from 2000-2014. Among its 20,401 administrative towns, 875 of them have over 50,000 population in built areas. Alex Zhang, Executive Director of Eco-Forum Global and Member of ICLEI Global Executive Committee and Konrad Otto-Zimmermann, Founding Director of ICLEI East Asia Secretariat and former Secretary General of ICLEI co-chaired the session, while Shu Zhu, Regional Director designate of ICLEI East Asia Secretariat facilitated the panel discussion. 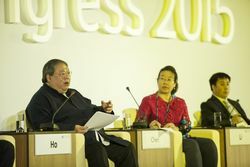 Experts who shared their insights on the challenges and opportunities of China’s new type of urbanization in the session include Patrick Ho, Deputy Chairman and Secretary General of China Energy Fund Committee; Tie Li, Director General of CCUD; Ying Chen, researcher at the Chinese Academy of Social Sciences (CASS) and Hailong Li, Deputy Director of Eco-City Planning and Construction Center under the Chinese Society for Urban Studies (CUSU) and Deputy Secretary General of China Eco-city Council. Unbalanced regional urbanization development, inefficient governance, heavy pressures on land, congestions, lack of social infrastructure for migrant workers in the cities, over-reliance on heavy industries and a lagging service sector, as well air pollution and smog, are some of the key issues pointed out by speakers on stage. Speaking from local governments’ perspectives, Donguang and Guiyang shared their cities’ development stories. Now a modern city famed for its manufacturing industry, Donguang has been facing particular challenge over the past decade in accommodating the needs of rural-urban migrants. While it has 1.8 million of permanent residents, its migrant population amounts to 8.2 million. To address the issues of socioeconomic equality, social stability and congestion caused by the large population, the city has set up special immigrant services institution and established a model of local rural urbanization – a joint development pattern of downtown area as center and 28 towns as supporting points. “Donguang city has been facing many development challenges over the past decades and has been tackling them one by one. 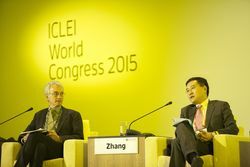 We still have a lot of urban issues, but I hope that the ICLEI World Congress will inspire us to explore new solutions and allow us to learn from cities around the world,” said Baocheng Yuan, Mayor of Dounguang City. Ningfeng Ji, Vice Mayor of Guiyang City shared the city’s vision in developing itself into a smart city with green buildings, clean transportation and low-carbon urban lifestyle. Aiming to reduce 18,000 tons of CO2 every year, the city has stepped up in closing down or relocating outdated industries, implementing investment control and environmental conservation and protection. With 1.2 million mu of forests – 45% of its land area, it is the first to be called in China a “national forest city”. Besides exploring the implications of the new type of urbanization rolled out by the Chinese national government, the sub-plenary also gave an insightful introduction to the construction of eco-cities, which has become the mainstream of global urban construction. According to Hailong Li, China has already built more than 100 eco-cities. Many of these eco-cities are located in the government-designated development area along the eastern coast, and are now in their implementation stage. International cooperation and partnerships, besides national leadership, is a key element in China’s eco-cities construction, said Li. While the country’s eco-cities construction is characterized by its high speed, huge number and large scale, it is still in exploration stage and is keen to learn from overseas experience – particularly the readily available technology and effective policies – and to translate these knowledge, skills and tools into local innovation, methodology and solutions that align with the international standard. The sub-plenary concluded with the MOU signing ceremony between ICLEI, Eco-Forum Global, CCUD and CSUS. Shermaine is the Communication and Knowledge Management Officer at ICLEI East Asia Secretariat.